Here I'm backing up the original Mr. Bean-- Dave Akeman a/k/a STRINGBEAN, at the 1965 U. of Chicago Folk Festival. This time we're on the main stage in Mandel Hall. "Stick with me, boy, and I'll take you to Nashville," 'Bean kept saying to his struggling college boy accompanist. Poor Stringbean. He met a tragic end. This (below, right) is from the 1996 Champlain Valley Folk Festival, and the large-hatted, bearded, and flower-shirted man is, of course, DAVE VAN RONK, a/k/a Uncle Moose. I'd interviewed him several times in the 1970s and '80s, and then nearly plotzed when I got asked to produce his long-held fantasy jug band version of Peter & the Wolf. It was an incredible experience, and Dave and I became friends. He even became something of a staple at Goddard College, where I was then teaching. Dave died on my birthday in 2002. We never got to the opera. RAMBLIN' JACK ELLIOTT was my first real musical hero, my "I wanna be like him" guy. I got to serve as his interlocutor for a one-man Woody Guthrie workshop at the '96 Champlain Valley Folk Festival. No wonder I'm happy. The silhouetted gent with the hat is the phenomenal fiddler CLARK KESSINGER. Steve Berlin, pres. of this 1968 U of C Folk Festival is in the background. The photo is from the Hyde Park Herald. Kessinger was accompanied by Gene Meade, perhaps the best fiddle tune back-up guitarist I've ever heard. Original New Lost City Rambler and master guitarist/banjoist TOM PALEY came to Montpelier several times in the '7 0s and '80s. This was one of them. I'm trying to back him up here, probably on a Swedish fiddle tune, his obsession at the time. (we called them "group studies") at Goddard College. Mike's one of my heros, despite the look on my face. Notice his pedagogically-subtle use of the black board. His concert that night was truly memorable. Click here for a tribute to Mike. ODETTA with my daughter, LEAH (center) and her friend Jessica, at my house c. 1986, during my tenure as director of the Onion River Arts Council. Where am I? In 1991, I went to Lafeyette, LA to produce Le Hoogie Boogie: Louisiana French Songs for Kids with MICHAEL and SHARON DOUCET. Lots of the Doucets's friends and colleagues participated, and I learned that Michael gets the royal treatment in every restaurant. In 1995, JANE SAPP & I, with a lot of help from our friends and Rounder Records, managed to get 21 kids ranging in age from 8-16 from 6 states into a studio to record We've All Got Stories: Songs from the Dream Project. It was both one of the most challenging and most rewarding things I've ever done. That's me, sitting, in the center and Jane to my left. My next musical partner-and roommate-was DAVID WEXLER. David turned me on to Van Ronk and worshiped in the Church of Gary Davis, hence the Gibson J-200, the first of many of David's fine and finer instruments. This was in our first apartment at U of C, 1964-5. The year before we'd sold a fellow first-year named George Gruhn his first old Martin guitar (an f-2; what folkie cared about f-hole guitars then?). David was president of the Folklore Society in '66, and I was in '67. David stayed in Chicago through his PhD and ended up a successful, respected psychologist in California. He died suddenly in 2002, a week before Dave Van Ronk. We drove each other nuts, and I miss him greatly. The picture below is from our 25th U of C reunion in1992. The ORIGINAL SOUTHSIDE JUG BAND (well, we were-at least as far as I know), 1964, in the dorm lounge. I think we were playing "Mobile Line" ("hey, lordy, mama, mama; hey, lordy, papa, papa talk about that Mobile Line") DAVID is undoubtedly growling. ROGER BORGENICHT is doing his laundry and PAUL SILVER is taking a nip. I don't know what's with me, but apparently my banjo playing was so appreciated that they made me put a shmatte behind the strings to mute the damn thing. I have no recollection whatsoever of having this photo taken of the LAKE COUNTRY STRING BAND, BOB "BEBOP" STOLTENBERG edition, post- and pre- Bob Hoban. Stolt's playing bass, which he then went off to Cremona, Italy to learn how to make. Now he's a bow specialist. The other guys are ANDY SACHER (mandolin), PETER McGRAW (pron. 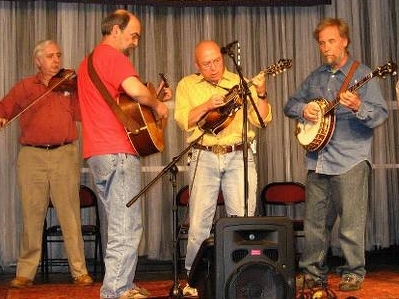 "McGrath," please; guitar, left), LARRY MARSCHALL (front left; banjo-take my word for it); and me (other guitar). This is the original LCSB-pre-Peter and with fiddler BOB HOBAN, described by the paper in which this c.1967 picture appeared as a "young, startled Charles Laughton." I was described as standing "as upright as an Old Testament hippie." Yeah, right. Hoban left us for a while to play with Steve Goodman and later worked with Vassar Clements and John Prine. Yo, Hoban, where art thou? A year after I moved to Vermont, I got a call from NORMAN DAYRON, who had produced a demo for the LCSB shortly before I left Chicago. (We had recorded it at night in the old Chess Records studio.) Now Mercury Records was interested, so back I flew for promo photos and a meeting with a Mercury VP. The meeting came to naught, and the photo . . . well, judge for yourself. From left to right: LARRY, ME, PETER, CLYDE STATS (who had replaced Stoltenberg on bass), ANDY, and HOBAN (who had returned for the demo and chance at the big time). In 1970 I left Chicago and academia for Vermont and cold, long winters-out of the ice box and into the freezer, I suppose. Here I'm actually playing outside without a parka and mittens, sitting in with my friends in SHADY GROVE in Hardwick, fittingly known as "Little Chicago." MIKE YATES has the hat and bass. Local legend GARY BARR'S playing guitar. And that's ANDY and MARSHALL, along with me (funny how I'm in all these pictures). I met COCO KALLIS in 1972. Our first musical venture was Coco & Friends, hastily formed for a gig at perhaps the most beautiful venue I've ever played in- a field at Indian Summer farm at the top of the Danville Hill Road in Cabot, VT. After PAUL MILLER (2nd from left) joined us we became COCO & THE LONESOME ROAD BAND, eventually acquiring GENE WHITE, JR. (far left) on bass (and sometimes fiddle) and ROB HYKYS (2nd from right) on pedal steel. These were our costumes when we won the Eastern States Country Music Association's band contest in 1976. On and onward: the two lads gazing off into the distance are JEFF SALISBURY (center), drums, and TIM "TINY" GLASGOW (far right), pedal steel. The beagle at Coco's feet is ASKER (what's her name?....). In 1975 I finally made it to Nashville with the LRB. We recorded a bunch of songs for Mike Figlio of Music City Workshop, and this (rt) was the result. "NEW ENGLAND SONG" (click for a taste) was a Billboard pick, made it onto a few charts, and got Coco the Maine (her home state) Country Songwriter of the Year honors. "She'll sing you a song about New England.."
A few years later, Danny has moved south, Andy has moved on to the up-and-coming Breakaway, and WILLY has moved to mandolin. PETE TOURIN (far left) inherited the bass spot, and David Bromberg Band alum NEIL ROSSI joined us on fiddle & mandolin. After recording Peter & the Wolf, as the KAZOO-O-PHONIC JUG BAND, we became the PALEOLITHICA PROMOOSICA JUG BAND (longer name) for two live gigs--the first a week at Lincoln Center playing for bussed-in NYC school kids. The 2nd was at the Flynn Theater, in Burlington, VT. BILLY NOVICK (clarinet, far left) did all the musical arrangements and also played pennywhistle. LUKE FAUST (far right) was an old Van Ronk crony, swell fellow, and great juggist. KENNY KOSEK (center, top) filled in for Jay Ungar on fiddle, and we added none other than ERIC WEISSBERG (another early inspiration; sitting on tub) on banjo. I stuck mostly to guitar, and DAVE told the story. This brings us up to the mid '90s, when the Joint Chiefs dis-jointed. For some more recent images and info, go to the Upstreet Booking page. Peter Craig has correctly identified: Neil Rossi (fid. ), Phil Zimmerman (mando. ), Larry Marschall (banjo). The 4th guy (guit.) is me. Y'all come back soon. New contest as soon as I can get to it.